Ipatasertib (RG7440) is an experimental cancer drug in development by Roche. It is a small molecule inhibitor of Akt. It was discovered by Array Biopharma and is currently in phase II trials for treatment of breast cancer. In vitro, ipatasertib showed activity against all three isoforms of Akt. 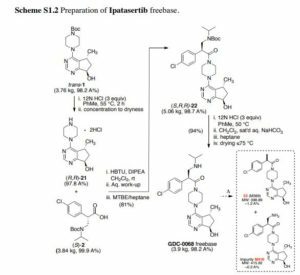 Ipatasertib is an orally-available protein kinase B (PKB/Akt) inhibitor in phase III clinical development at Genentech for the treatment of metastatic castration-resistant prostate cancer in combination with abiraterone and prednisone. In 2014, orphan drug designation was assigned in the U.S. for the treatment of gastric cancer including cancer of the gastro-esophageal junction. Ipatasertib. An orally bioavailable inhibitor of the serine/threonine protein kinase Akt (protein kinase B) with potential antineoplastic activity. 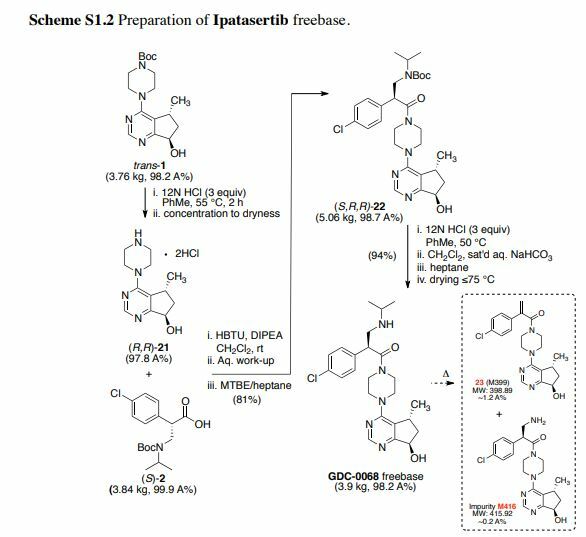 Ipatasertib binds to and inhibits the activity of Akt in a non-ATP-competitive manner, which may result in the inhibition of the PI3K/Akt signaling pathway and tumor cell proliferation and the induction of tumor cell apoptosis. Activation of the PI3K/Akt signaling pathway is frequently associated with tumorigenesis and dysregulated PI3K/Akt signaling may contribute to tumor resistance to a variety of antineoplastic agents. Check for active clinical trials using this agent. It has been found that ipatasertib exhibits a very high solubility (>1 g/g water; >2 g/g water/ethanol 1:1) and a very high hygroscopicity (˜6% at 50% RH, >35% at 95% RH). Whereas poor solubility is often a limiting factor in the development of galenical formulations of other API’s (active pharmaceutical ingredient), a high solubility can equally be problematic for the process performance. 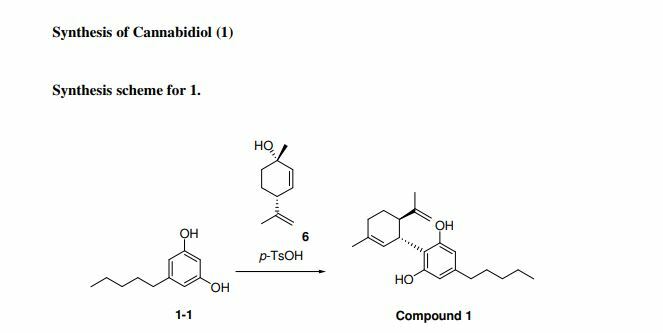 Due to this very high intrinsic hygroscopicity of the API, ipatasertib drug substance tends to auto-dissolve to a honey-like viscous liquid at increased humidity. Such high solubility and hygroscopicity may pose serious problems for processing as well as for stability and shelf-life of the final product. Therefore, conventional pharmaceutical compositions comprising ipatasertib and processes for the manufacture of pharmaceutical compositions comprising wetting (e.g. wet granulation) are difficult due to the high solubility and high hygroscopicity of the API. Herein, the first-generation process to manufacture Akt inhibitor Ipatasertib through a late-stage convergent coupling of two challenging chiral components on multikilogram scale is described. The first of the two key components is a trans-substituted cyclopentylpyrimidine compound that contains both a methyl stereocenter, which is ultimately derived from the enzymatic resolution of a simple triester starting material, and an adjacent hydroxyl group, which is installed through an asymmetric reduction of the corresponding cyclopentylpyrimidine ketone substrate. A carbonylative esterification and subsequent Dieckmann cyclization sequence was developed to forge the cyclopentane ring in the target. The second key chiral component, a β2-amino acid, is produced using an asymmetric aminomethylation (Mannich) reaction. The two chiral intermediates are then coupled in a three-stage endgame process to complete the assembly of Ipatasertib, which is isolated as a stable mono-HCl salt. Ipatasertib mono-HCl (3.23 kg, 80% yield) as an off-white solid. Analytical results: 99.7 A% [0.26% S,R,S-diastereomer observed)]; impurity 23 (M399) was not detected (<0.02 A%) [Method 2.2]; ruthenium content by IPC-AES = 5 ppm; analysis for PF6 anion by CAD-HPLC resulted in not detected [Method 2.3]; residual solvent = 0.4% EtOAc; ion chromatography (IC) = 8.5% chloride (1.14 salt equivalent); DSC = 141 °C; FTIR (neat) 3269 (br OH), 2961–2865 (N–H stretch), 1637 (C═O stretch); 1H NMR (600 MHz, DMSO-d6) 9.39 (s, 1H), 8.64 (s, 1H), 8.49 (s, 1H), 7.49 (q, J = 2.9 Hz, 2H), 7.41 (q, J = 2.9 Hz, 2H), 5.58 (s, 1H), 4.91 (t, J = 6.9 Hz, 1H), 4.78 (dd, J = 8.9, 4.5 Hz, 1H), 3.81 (m, J = 3.3 Hz, 1H), 3.68 (m, J = 3.3 Hz, 1H), 3.67 (m, J = 3.1 Hz, 1H), 3.65 (m, J = 3.2 Hz, 1H), 3.63 (m, J = 3.6 Hz, 1H), 3.59 (m, J = 4.3 Hz, 1H), 3.51 (m, J = 3.5 Hz, 1H), 3.46 (m, J = 3.5 Hz, 1H), 3.36 (m, J = 3.2 Hz, 1H), 3.30 (m, J = 5.7 Hz, 1H), 3.21 (m, J = 3.4 Hz, 1H), 2.98 (m, J = 5.8 Hz, 1H), 1.97 (m, J = 4.8 Hz, 2H), 1.26 (d, J = 6.6 Hz, 3H), 1.25 (d, J = 7.0 Hz, 3H); 13C NMR (150 MHz, DMSO-d6) 170.2, 168.2, 159.4, 155.2, 135.3, 132.5, 129.7 (2C), 129.1 (2C), 120.8, 71.7, 50.4, 47.0, 44.8, 44.5, 44.1, 41.4, 40.8, 34.5, 19.8, 18.4, 18.1; HRMS calcd for C24H32ClN5O2 457.2245; found [M+H]+ 458.2306. Ipatasertib freebase (3.9 kg, 98.2 A% containing ~1.2% impurity 23 (M399) and impurity M416 at 0.2 A% [Method 2.2]) as tan solid. 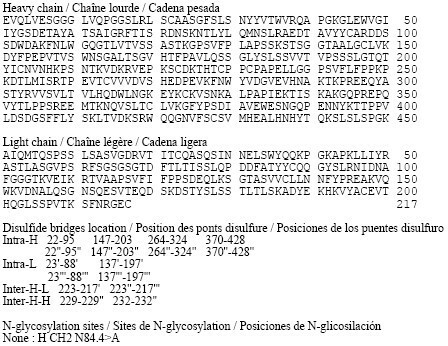 By CAD-HPLC (see Figure S1-2), the PF6 anion was present in ~0.86 A% [Method 2.3]; Ion chromatography (IC) = 4.0% chloride (0.56 salt equivalent); 1 H NMR (600 MHz, DMSO-d6) 8.44 (s, 1H), 7.45 (d, J = 8.5 Hz, 2H), 7.40 (d, J = 8.5 Hz, 2H), 5.48 (br s, 1H), 4.86 (t, J = 6.9 Hz, 1H), 4.58 (dd, J = 7.3, 4.6 Hz, 1H), 3.74 (m, 1H), 3.40 (m, 1H), 3.63 (m, 2H), 3.61 (m, 1H), 3.42 (m, 1H), 3.57 (m, 1H), 3.18 (m, 1H), 3.50 (m, J = 2.9 Hz, 1H), 3.09 (m, J = 3.1 Hz, 1H), 3.42 (m, 1H), 2.87 (m, J = 4.7 Hz, 1H), 2.00 (m, 1H), 1.92 (m, J = 3.1 Hz, 1H), 1.15 (d, J = 6.4 Hz, 6H), 1.03 (d, J = 6.9 Hz, 3H); 13C NMR (150 MHz, DMSO-d6) 172.0, 169.0, 159.6, 156.3, 136.3, 132.1, 129.7 (2C), 128.9 (2C), 120.9, 72.0, 49.4, 48.7, 45.4, 44.9, 44.8, 44.6, 41.4, 40.9, 34.3, 20.1, 19.9, 19.7; HRMS calcd for C24H32ClN5O2 [M+H]+ 458.2317; found 458.2312. See supporting information (S2) for the NMR spectra (DMSO-d6) of Ipatasertib freebase: ( 1 H) S2, Figure S2-5.12 and ( 13C) Figure S2-5.13. Herein, the route scouting and early process development of a key cyclopentylpyrimidine ketone intermediate toward the synthesis of Akt inhibitor Ipatasertib are described. Initial supplies of the intermediate were prepared through a method that commenced with the natural product (R)-(+)-pulegone and relied on the early construction of a methyl-substituted cyclopentyl ring system. The first process chemistry route, detailed herein, enabled the synthesis of the ketone on a hundred-gram scale, but it was not feasible for the requisite production of multikilogram quantities of this compound and necessitated the exploration of alternative strategies. 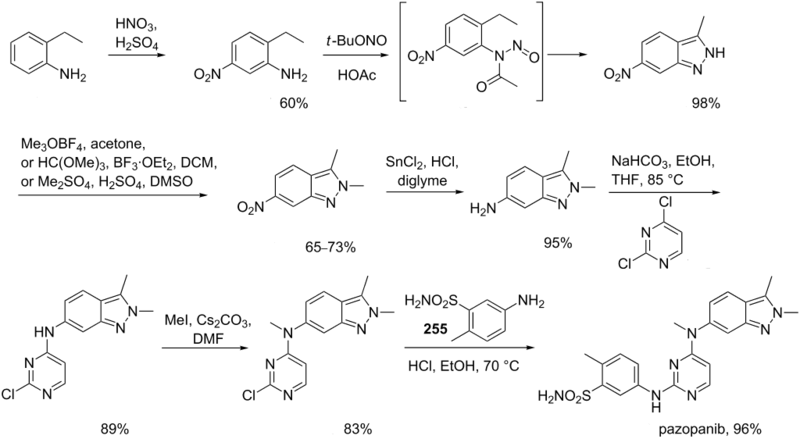 Several new synthetic approaches were investigated towards the preparation of the cyclopentylpyrimidine ketone, in either racemic or chiral form, which resulted in the discovery of a more practical route that hinged on the initial preparation of a highly substituted dihydroxypyrimidine compound. The cyclopentane ring in the target was then constructed through a key carbonylative esterification and subsequent tandem Dieckmann cyclization–decarboxylation sequence that was demonstrated in a racemic synthesis. This proof-of-concept was later developed into an asymmetric synthesis of the cyclopentylpyrimidine ketone, which will be described in a subsequent paper, along with the synthesis of Ipatasertib. By DR ANTHONY MELVIN CRASTO Ph.D in 0rphan drug status, Phase3 drugs on June 25, 2018 .